Groove here – the owner of iateyourbaby.com. You may have tracked me down, stumbled upon the website, i may have given you the link, maybe i downloaded a file or checked my mail on your computer and you saw the URL in your browser. However you ended up here, welcome! You’re probably wondering what the hell is the point of this whole website. To tell you the truth, i wonder the same thing myself sometimes. But if you’re looking for answers, i can tell you what i know – and you can judge it from there. Basically, i wanted a domain name so that i could play around with web design without the restrictions of using free space or donated space from a friend. I didn’t want anything too topic specific – just something silly to play around with. And so, iateyourbaby.com was born – and in it’s infancy, i was tempted to eat it. But here it remains, as a place for me to stash files for myself and friends, put up silly pictures and videos, test out functions i’ll never use, host questionable material for the denizens of TW, mess with google maps and a ‘host’ of other useless junk that basically makes the entire website pointless. So if you were looking for some website chatting about the eating of babies… well, the image above is pretty much all you’ll get. I’m sorry to disappoint you. 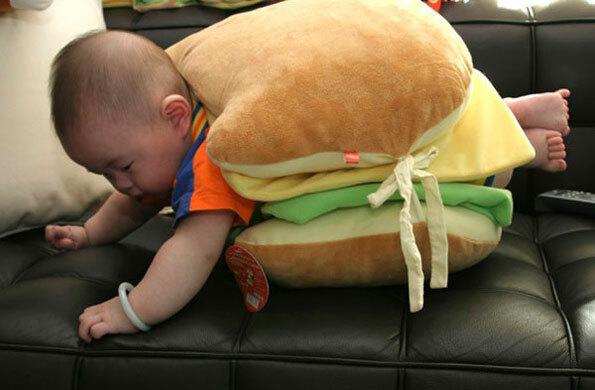 I don’t even know whose baby that is, or why they went to the trouble of putting it in some kind of odd burger costume (or something?). Welcome to the new site design. I’d like to welcome our new overlord, Trevor Benson. He’ll be taking over the reins here at IAteYourBaby.com. That way I can’t be resposible for what he posts, right?